« Older: Cleaning up the island, one campaign at a time! 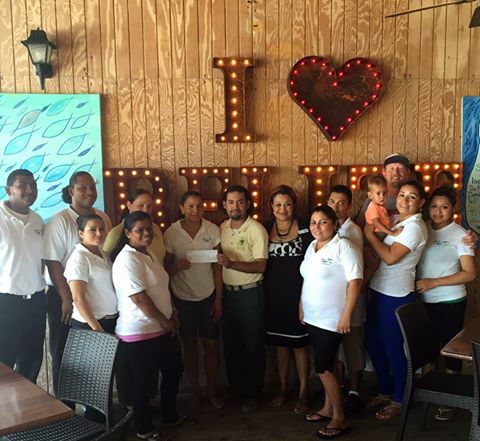 A $1,484 check was presented to the Ambergris Caye Elementary School (ACES) as part of Blue Water Grill’s monthly donation program. During the month of May, BWG customers donated $782, which was matched 100% by the establishment. In addition to monthly donation program funds, an anonymous donor from Houston, Texas, USA through BWG, also donated $3,000 to the school. The generous donation will go towards the school’s scholarship program for children with disabilities. “Words cannot explain how grateful we are for this donation. It will greatly benefit our island children living with disabilities. We thank everyone that donated,” said ACES. For the month of June, monies raised will go to the San Pedro Belize Red Cross to support hurricane season initiatives. “With the start of hurricane season, it's vital that we support our local Red Cross group that does so much to help our community in times of need. And they also provide invaluable training for our island and support countless local efforts to keep San Pedro healthy,” said BWG. BWF thanks everyone who donated in during the month of May and encourages patrons to continue donating towards charitable efforts in San Pedro. Ambergris Caye Elementary School proudly presents their Ball Gowns & BBQ Charity Gala & Art Auction!